A brief overview was given on the Creation page. The story for the Pyrenees begins in the latest Paleozoic when it underwent extension, or spreading apart. This extension continued off and on until the early Cretaceous when oceanic crust first formed. The sediments during this time consist of continental deposits (red beds) followed by Triassic evaporites then carbonates in the Jurassic. The types and thicknesses of the sedimentary packages of this time offer clues as to the timing of tectonic events. 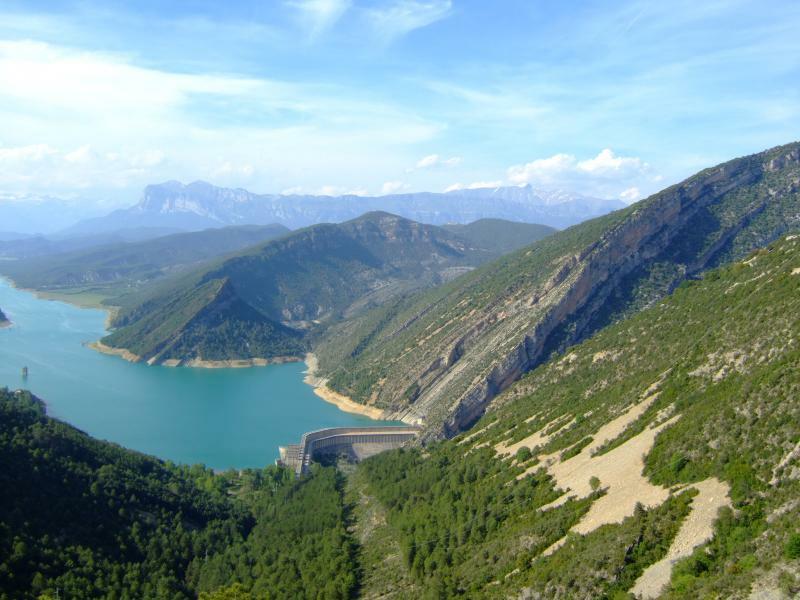 Until the late Cretaceous, the Pyrenees region was purely undergoing extension. In the Late Cretaceous, the African and Iberian Plates moved northward and began to collide with the European Plate. This started an inversion in the Pyrenees region as seen in the picture below. Note the normal faulting in the mountain in the background. The beds in the rightmost faultblock are rotated down and overturned due to the compression of the next fault block to the right. These faults are sliding along the mobile Triassic evaporites. The timing of the extension is early Cretaceous as evidenced by the thickening of the package into the fault. The timing of the inversion is later Cretaceous. Plate convergence continued through the lower Tertiary. In the foreland basin a deepwater foldbelt formed. In the field you can determine the age and progression of fold formation by studying their relationship with sediment deposition, in this case, turbidites. In the northern part of the basin folds were emergent before the deposition of the turbidites as they clearly go around the structures. As you go south the turbidites thin over the crests of the anticlines indicating they were deposited at the same time as the structural deformation. Further south the turbidites are caught up in the folds with no thickness change indicating they pre-dated the folding. Later these folds were rotated clockwise (see the anticlines in the picture below). In the latest Eocene to Miocene the Iberian Plate began to underthrust the European Plate pushing the Pyrenees Mountains up towards their present position. The foreland basin filled completely in with terrestrial deposits of material shed off the highlands. 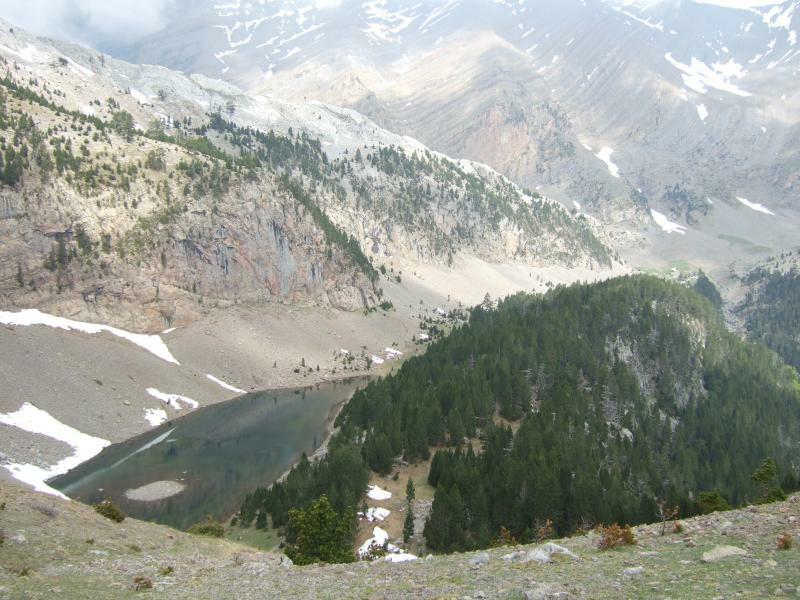 Even in this brief and simplified overview of the history of the Spanish Pyrenees, I hope you can appreciate the number of different events that took place and the solid pieces of evidence available in the field. First the area experienced crustal thinning to rifting in what geologists understand to be the normal manner. This normal progression of rifting is evidenced by terrestrial deposits grading into carbonates and evaporites depending on how restricted the basin was. As rifting continues, clastic deposits come in in either a deltaic or shallow marine setting. These deposits give clues as to the timing of structural deformation based on growth of section into the faults which are moving contemporaneously. Second, the basin inverts as the plates change direction from diverging to converging. A foldbelt appears in the newly formed foreland basin that affects deposition of shallow and deepwater sediments. Then as the basin closes it gets filled in with more terrestrial deposits. A year-long global Flood simply could not be responsible for all of these events. The basin’s history starts with evidence of land-derived to very shallow water sedimentation in a restricted environment. The Flood is interpreted by YECs to be very deep and therefore NOT restricted at all. Also, the sediment thicknesses give irrefutable clues as to the timing of their deposition. They clearly happened during different times and in different tectonic regimes. The evidence of the different plate movement and its effect on sedimentation is enough to rule out being the result of a single year-long event, no matter how catastrophic it may have been. In fact, a more catastrophic event would tend to wipe out the delicate clues we see preserved in the field.